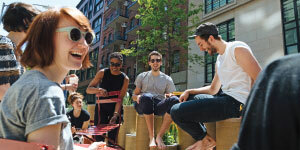 Located in Greenwich Village in the heart of New York City, The New School is the only comprehensive university housing a world-famous design school, a premier liberal arts college, a renowned performing arts college, a legendary social research school, and many more schools and programs designed for students of every age and stage of life. Imagine a university where scholars, artists, and designers find the support they need to challenge convention and fearlessly create positive change in the world. Imagine a community where walls between disciplines are dissolved, so journalists collaborate with designers, architects with social researchers, media specialists with activists, poets with musicians. Imagine an intellectual and creative haven that never has and never will settle for the status quo. The New School is just such a university community, attracting students from all over the world to its home in the heart of Greenwich Village. Founded in 1919 by those who imagined a school that would rethink the purpose of higher education, The New School now offers more than 10,000 students areas of study across more than 150 undergraduate and graduate degree programs. No matter what area of study students pursue, they discover a unique form of creative problem solving that will forever change the way they investigate and create—relentlessly questioning convention, collaborating across disciplines, and taking risks. One of the largest and most prestigious degree-granting colleges of art and design in the nation, Parsons offers undergraduate degree programs in New York City and Paris. Parsons’s intensive programs and distinguished faculty embrace innovation, pioneer new uses of technology, and instill in students a global perspective in design. The faculty are drawn from active professionals, and the students hail from more than 65 countries and every possible background, bringing a truly global perspective to classes. Eugene Lang College of Liberal Arts is the newest and fastest-growing urban liberal arts college in New York. The vast intellectual and cultural resources of the city are integrated into the curriculum at every level through a wealth of partnerships, internships, and service learning programs. Lang has a deep commitment to a liberal arts education that reaches across and beyond traditional areas of study. Students pursue connections between the humanities, fine arts, and social and natural sciences through a curriculum that includes both traditional and innovative majors, minors, and interdisciplinary programs. Described by The Princeton Review as the best college in the country for encouraging debate and discussion, Lang has a rigorous program of study based on a seminar approach to teaching and learning. The BA/BFA pathway at The New School is a five-year dual-degree program through which students can earn a Bachelor of Arts degree from Eugene Lang College and a Bachelor of Fine Arts degree from either Parsons or the School of Jazz. New School students have access to excellent resources, including a vast library consortium that houses approximately three million volumes, computer labs with the latest technology, and state-of-the-art performance spaces, practice rooms, and design studios. 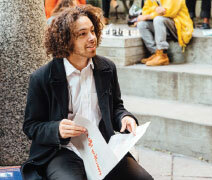 Students at The New School play a very active role in the life of the University. From informal clubs to student unions, art shows to film festivals, there are hundreds of opportunities outside the classroom. The New School offers undergraduate programs designed specifically for working adults and returning students. Guided by a faculty advisor, students have the option to self-design an individual course of study in the liberal arts based on their professional goals. The program accepts up to 84 transfer credits, including credit for college-level learning from work and life experience, and may be completed in New York City, online, or in a combination of on-campus and online study.